Rock & Rose aims to fill the void that simply can’t be filled by the many, many restaurant chains that take pride of price in the upmarket town of Richmond-upon-Thames. Quiet, understated and elegant: Rock & Rose is none of those things. It’s a fun, loud, brash, Olly Murs-playing, slap-your-thigh riot. Seemingly out of place in leafy Richmond, Rock & Rose is packed with character (whether it’s to your own particular taste or not). A glance around the quirky interior and you’ll see Wedgwood chandeliers and shimmering candlestick holders against a backdrop of rose-patterned Cecil Beaton wallpaper. The toilets are differentiated by pictures of Marilyn Monroe and James Dean, and the cocktails are the size of an LA Hills infinity pool. 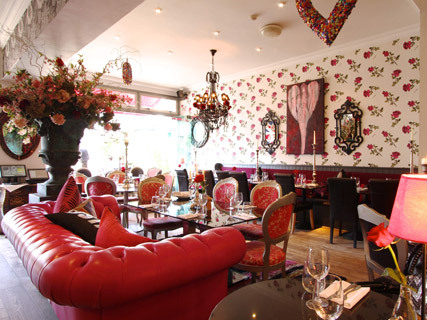 Rock & Rose was seemingly made for parties – think your typical birthdays, hen dos, office gatherings – but, before you write off this restaurant, with its hot pink Regency flock wallpaper and bespoke Swarovski crystal-studded Louis XVI-style chairs, as just a good-time venue, wait until you try the food. The electic menu, which has something for everyone, and quality of food has in no way fallen victim to the OTT decor and pumping music. We dined on a feast of goat’s cheese, fillet steak and delicious banoffee pie. All of which were faultless. Rock & Rose really is proof that you shouldn’t judge a book by its cover. Rock & Rose’s sister restaurant, Annie’s in Chiswick is 10 years old in September. For more info visit the Rock & Rose website or Annie’s website.